Building and maintaining muscle in old age is important, as it keeps seniors strong, independent, and prevents the risk of falls and injury. Unfortunately, many seniors waste away as they live sedentary lifestyles. Of course, regular exercise is important to building muscle, but diet plays a large role too. The problem is that seniors tend to eat less so they don’t get all the essential nutrients they need to maintain or build muscle. If this sounds like you, then we have some simple diet changes you can make that will help you build more muscle so that you can continue to be strong. Eat more protein: The most obvious diet change is to eat more protein. Protein is necessary for muscle building along with repairing them. Although each person is different and may require unique amounts of protein, there are some general guidelines you can follow. The winning number of protein intake has been found to be 1.6 grams of protein per kilogram of a person’s weight—or 0.73 grams per pound. For example, if you weigh 180 pounds, you need around 130 grams of protein. A three-ounce steak has roughly 30 grams of protein. The best sources of protein are from fish, lean meat, and eggs. Eat protein at the right time: Eating protein is fine and dandy, but knowing the right time to consume protein can go far for promoting strong bones. First and foremost, you should always consume protein after a workout to repair and build muscles. Eating protein a couple of hours prior to a workout is also essential. Lastly, you should plan your protein intake and space it out throughout the day so that you are not overeating protein. 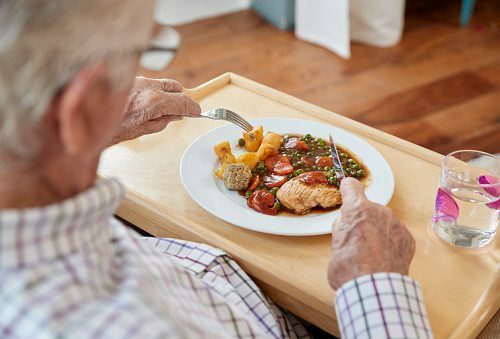 Eat more calories: As mentioned, seniors often tend to eat less for a variety of reasons. But this decrease in calories also contributes to muscle loss. Furthermore, more calories mean more fuel for your workouts. On the other hand, if you aren’t performing any exercise, then you may not need to increase your calories by much. Avoid junk food: There are hundreds of reasons to avoid junk food, and here is another one. Junk food increases fat, which can put you in a caloric surplus, meaning you will gain weight, not muscle. Eat carbs carefully: Some people avoid carbs, some people simply eat too many, and others eat the wrong kind. The fact of the matter is that carbohydrates are essential for energy, but eating the wrong ones or too much can work against you. Good sources of carbohydrates include sweet potatoes, brown rice, and squash.